This feature is only available to players of level 45+. 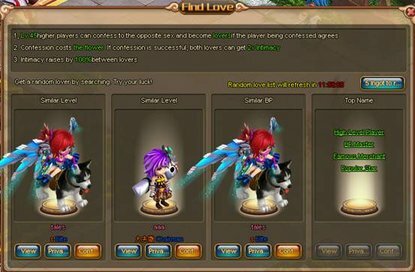 To start taking part in this feature players need to confess to another player who meets the level requirement for the Love system. To start players need to open the confession panel and choose the amount of roses to present to the person they want to confess to as well as even write a vow. Economical - Costs nothing and offers no special effects (mainly for newer and less rich players). Romantic - Costs 521 ingot, invites friends from both players to send their wishes, which turn into flowers and boost the couple's popularity.The couple will also receive a romantic box. Luxury - 1314 Ingot required for this one, here the whole server will be able to send their wishes, boosting popularity of the couple, they will also receive a love and heaven box. Couples also have an intimacy level, this increases as they interact with one another. This can be done so by sending flowers to each other or clearing dungeons and fighting powerful boss monsters together. If players wish to they can end their relationship at any time.